Khondker Mazharul Islam is a first-generation farmer who credits the Virginia Beginning Farmer and Rancher Coalition Project with helping him start a livestock operation in Bedford County, Va.
An international animal feed trader is creating a new life for himself on 126 acres of rolling pasture in Southwest Virginia, where he is raising and processing goats, cattle, chickens, and sheep to meet the increasing demand for meat processed according to Muslim standards. Khondker Mazharul Islam, 53, is a first-generation farmer from Bangladesh whose dreams of starting a halal meat processing plant were shattered in 2004 when regulations prevented him from opening his business in Bosnia. Now, thanks to the Virginia Beginning Farmer and Rancher Coalition Project, Islam has started a farm in Bedford County, Va. The project is housed in the Department of Agricultural and Extension Education, and Virginia Cooperative Extension is one of the project’s many partners. The program received a $740,000 grant from the U.S. Department of Agriculture and was created to reverse the steady decline in the number of people entering farming. Today, the average age of the American farmer is 57, compared with an average age of 50 in 1978. In 2007, more than a quarter of all U.S. farmers were 65 or older. “As our farming population ages, it is essential that we support, educate, and cultivate new communities of farmers,” said Kim Niewolny, project director and assistant professor of agricultural and extension education. Using a coalition approach, the project is a collaboration of 26 Virginia organizations that help beginning farmers enhance the viability of their new enterprises. The project also has a mentoring network that new farmers can use to gain technical assistance and marketing insight from experienced farmers. Anne Pendrak of Floyd County, Va., wants to start her own vegetable operation and is looking for technical assistance and marketing insight from experienced farmers. 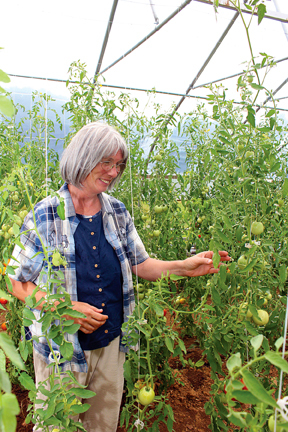 Anne Pendrak of Floyd County, Va., toured a farm in Floyd because she wants to start her own vegetable operation. She has established relationships with several farmers, including Tenley Weaver, owner of Good Food-Good People, a local fruits and vegetable distribution business. “The experienced farmers will teach me how to market my products,” Pendrak said. Using the coalition’s curriculum, project partners provide classroom, online, and hands-on learning opportunities that last from six months to one year. Short-term classes are also available. Participants develop a whole-farm plan that includes the following topics: family resource assessment, land acquisition, marketing, business planning, and sustainable production practices. His plan includes a three-year lease with an option to buy the land. 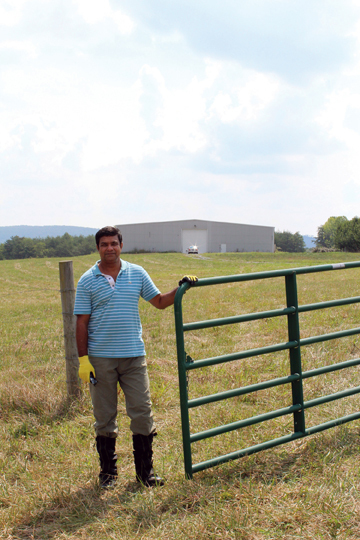 He has a contract to sell his livestock to a company that produces USDA-approved halal meat. Jim Hilleary, coalition partner and coordinator of the Northern Piedmont Beginning Farmer Program, said business plans help farmers make rational decisions free of emotion. “We provide beginning farmers with the complete picture of what it takes to start and operate a farm so they can make decisions that will benefit them and their families,” Hilleary said. To learn more, visit the Virginia Beginning Farmer and Rancher Coalition Project.